Sascha L., islamist and Dragon Ball fan? 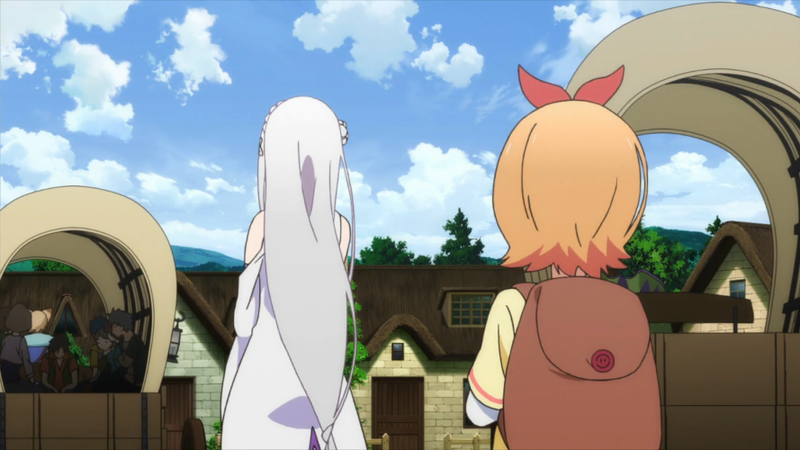 Due to internet connection problems, The 650-Cent Plague had been on hiatus for some weeks, but now it’s back with another anime-related news item that I just can’t resist to share. In an otherwise serious and sad story, here’s a hilarious detail that doesn’t seem to have been picked up by any other media on the web: last month, the trial of Sascha L. from Northeim (Germany) began, a former supporter of the Islamic State who had built a bomb which he planned to use against German policemen or soldiers. This part of the story is well known and had also been reported in international media (e.g. Washington Post). By now he [Sascha L.] would have renounced all radical plans, and he would be ready to participate in an opt-out program. Why, then, had he put up a flag of the Islamic State and an oath of allegiance to the ‘caliph’ Abu Bakr al-Baghdadi in his cell, assessor Petra Bock-Hamel wanted to know. ‘I don’t like white walls,’ was Sascha L.’s reply. 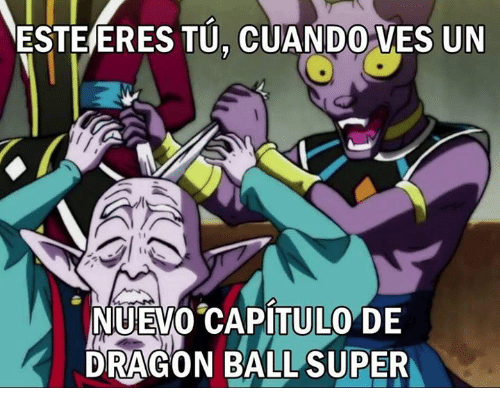 After speaking to a psychologist he would have actually wanted to take the IS flag down, ‘but then there was Dragon Ball Super on television, and unfortunately I forgot about it.’ Later, judicial officers had photographed the walls of his cell – with flag and oath. Several things are remarkable about Sascha L.’s statement, but the most striking of all is the way in which it is reported in the newspaper article: no explanation at all is given what “Dragon Ball Super” actually is. As comic experts, we know that it is a current anime series by Akira Toriyama, a sequel to his earlier series Dragon Ball / Dragon Ball Z, and even if we haven’t watched it ourselves, we have some idea what Toriyama’s art style looks like and what the story is about. But how many of the newspaper readers would know? One might have expected at least a gloss in brackets such as “… Dragon Ball Super [a Japanese animated series] on television…”, but no more is said about that subject in the article. This is the third blog post of a series on the occasion of ‘100 Years of Anime’. Read the first post here and the second one here. 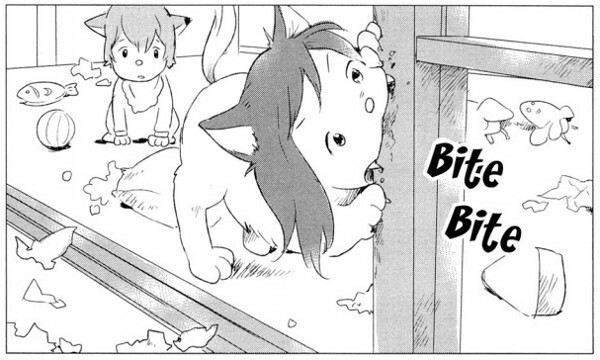 A major difference between anime and manga is the representation of dialogue: in manga it’s written in speech bubbles, whereas in anime it’s human speech recorded and played back as part of the audio track. 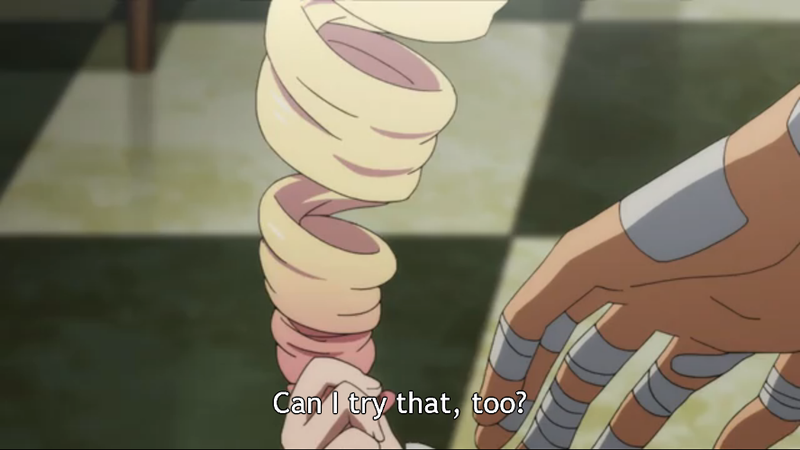 It’s important to bear in mind that dialogue in anime is still only a representation of a fictional dialogue – we can’t actually hear an anime character’s voice; what we hear is merely an actor speaking lines in a recording studio. That being said, individual voice actors contribute a great deal towards our perception of a character through his or her voice, in addition to scriptwriters and directors on the one hand and the dialogue director (a.k.a. Automated Dialogue Replacement (ADR) director) on the other hand. And just as with theatre actors and film actors, the distinction between voice actors and the characters they portray gets blurred in the imagination of some viewers, which is probably why the latter develop an interest in voice actors as the ‘actual people’ behind the characters. This is the second blog post of a series on the occasion of ‘100 Years of Anime’. Read the first post here. On this day three months ago, the memorial service for Jaden F. was held in Herne, Germany. 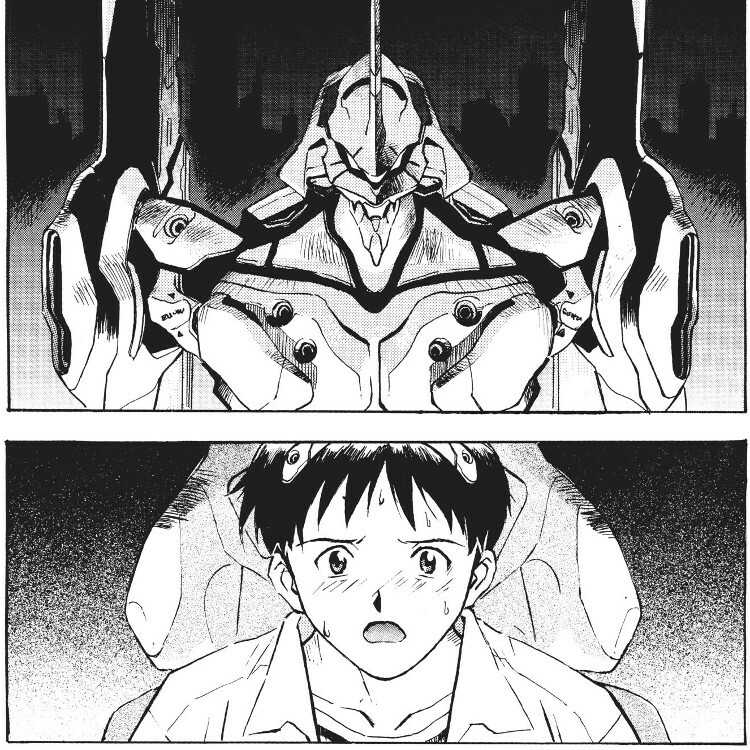 Jaden had been the first of two victims stabbed to death by Marcel H., whom the media has linked to anime. One German news magazine in particular, Stern (No. 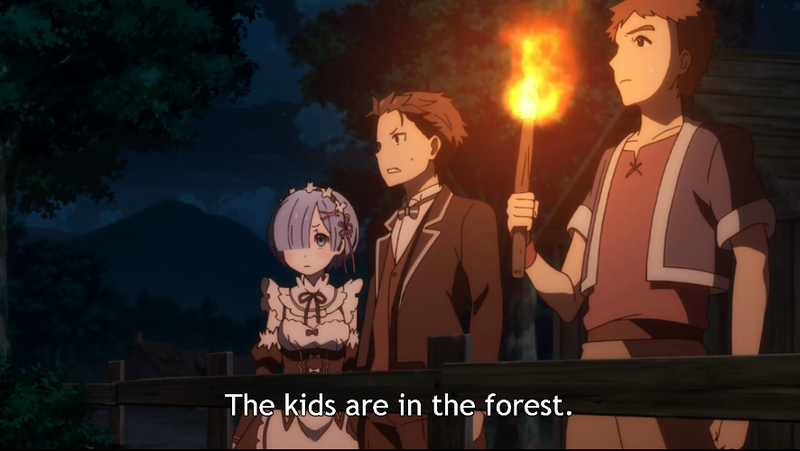 12, March 16), has emphasised the ostensible connections of the murders to anime. The events were also covered by international media (e.g. Daily Mail, Telegraph, Independent), but none of them even mentioned anime. 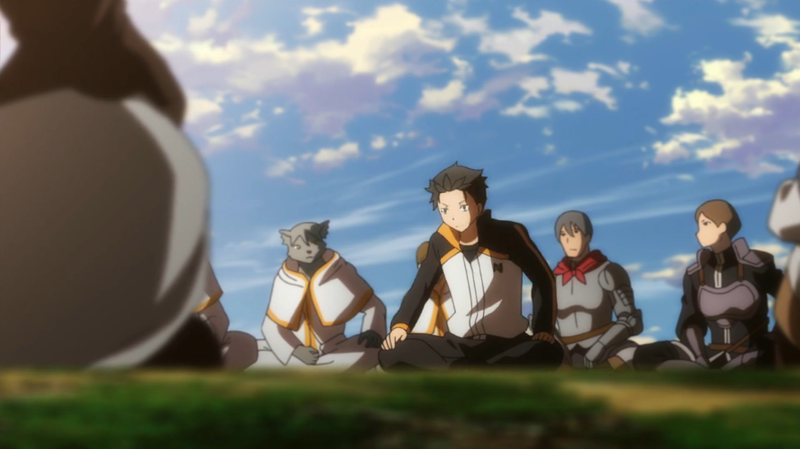 Therefore, the (thankfully limited and short-lived) ‘moral panic’ regarding anime doesn’t seem to have reached the Anglophone anime blogosphere either, which is why I’ll sum up the story here. 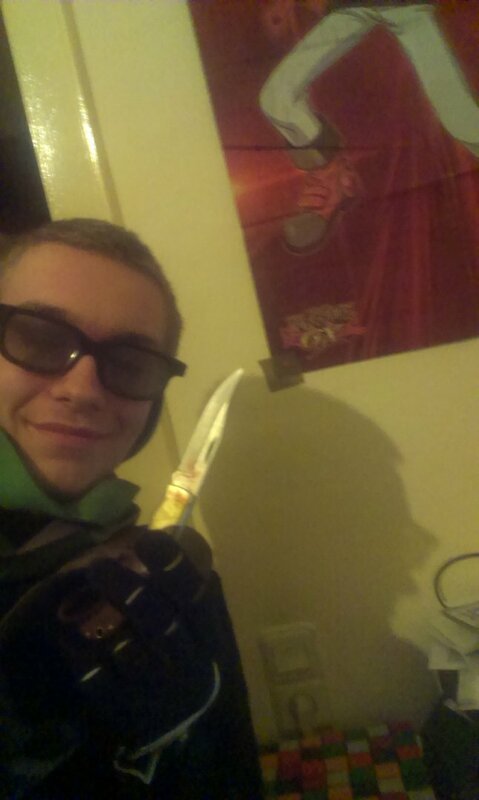 These are the facts: Marcel H. is a 19-year old NEET who had unsuccessfully applied to join the Army in February. On March 6, he lured the nine-year old neighbours’ son into his house and killed him with a knife. 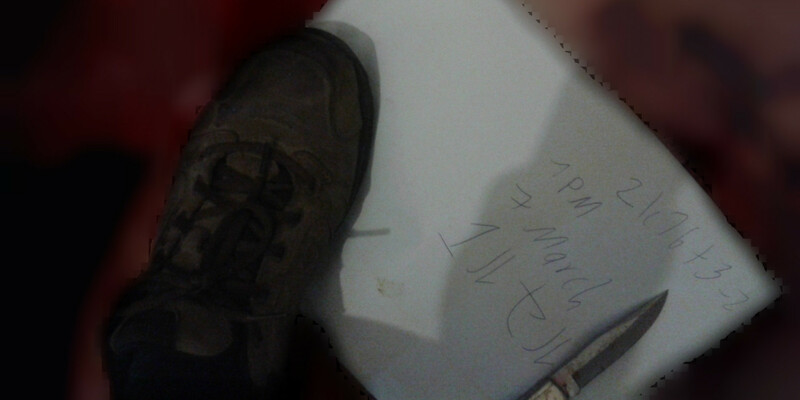 Then he went to an acquaintance’s, 22-year old Christopher W., and killed him early in the morning on March 7. Marcel H. stayed at Christopher W.’s apartment until March 9, when he set it on fire, went to a Greek diner, told the owner to call the police, and let himself be arrested. Another connection to Yu-Gi-Oh! 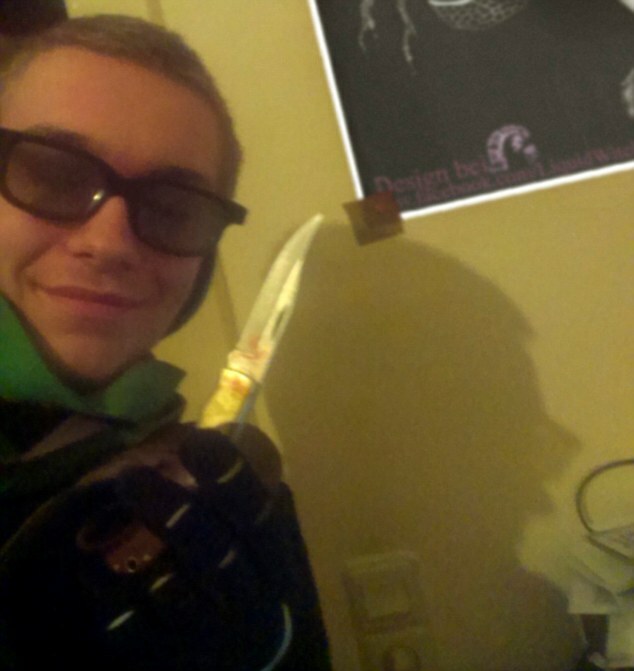 is Christopher W., Marcel H.’s second victim, who ran a Yu-Gi-Oh! site on Facebook; apparently they got to know each other through the game and used to play Yu-Gi-Oh! video games together. Finally, Stern points out that there are two characters in the Yu-Gi-Oh! anime with the same first names as Marcel H. and Jaden F.: Yu-Gi-Oh! GX protagonist Jaden Yuki and his antagonist Marcel Bonaparte. Stern implies that Marcel H. identified with the villain and acted out the Yu-Gi-Oh! story by attacking Jaden. The only detail that doesn’t quite fit is that the Stern article also says that Marcel H. had been learning Japanese in order to be able to read manga and watch anime in their original language; in the Japanese original version of Yu-Gi-Oh! 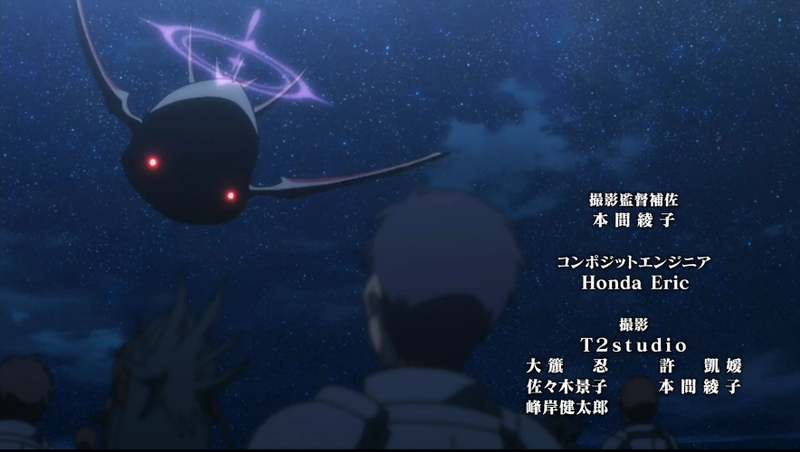 GX, however, Jaden is called “Jūdai” and Marcel “Marutan” or “Martin”. Apart from the Yu-Gi-Oh! connection, there’s not much that links Marcel H. to anime. 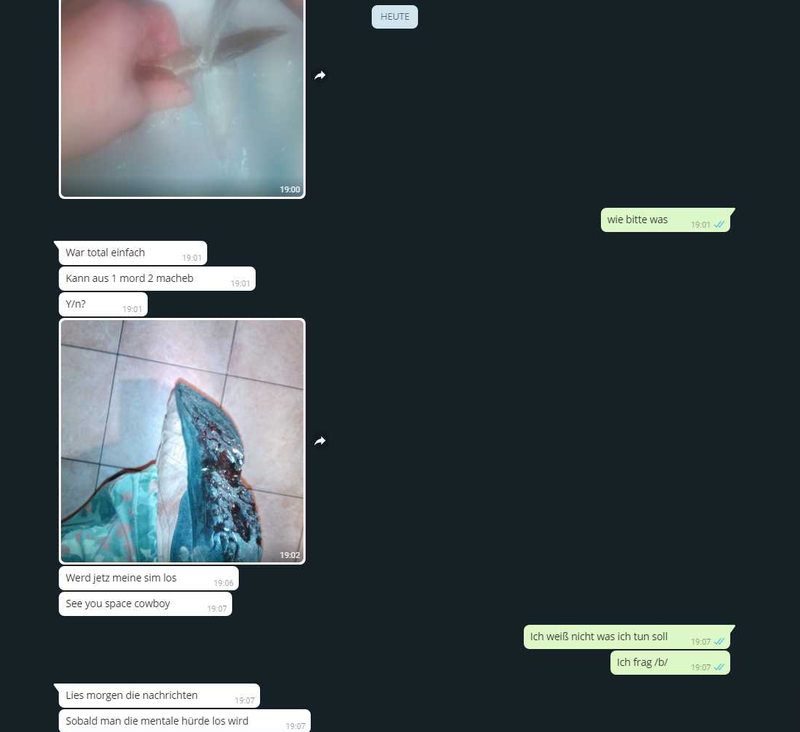 Some chat messages have surfaced in which Marcel H. talks to another person about the murders at the time when he committed them, and in one message he says, “See you space cowboy”, which indeed is a quote from the anime Cowboy Bebop. The other things mentioned in the Stern article are rather vague connections to Japan than to anime specifically: at the time of committing the murders, Marcel H. posted a picture of a handwritten note on which he had signed his name in Japanese, and he owned “bamboo swords which he kept under his bed like a treasure. Furthermore a wooden bow and five Japanese ceremonial knives” (all translations mine). Luckily, the Stern article has failed to start a witch hunt on anime fans like the ones that e.g. video gamers and heavy metal fans have had to endure in past decades. But the article shows that anime has still a long way to go before it can be said to be part of the mainstream. This is the first part of a series of blog posts celebrating 100 Years of Anime. (There is evidence of animated films produced in Japan before 1917, but 1917 the ‘official’ year of birth of anime.) 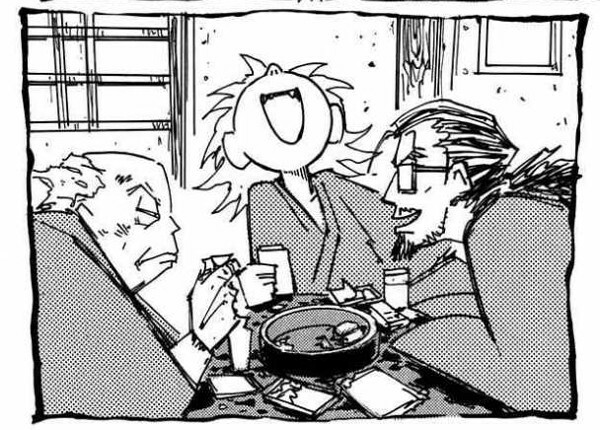 Instead of emphasising that anime and manga are completely different media and whining about how fandom (and sometimes even scholarly discourse) around Japanese popular culture is dominated by anime at the expense of manga, The 650-Cent Plague is going to join in on the celebration and run a couple of posts on anime. Granted, there are many similarities between anime and manga, but today we’ll look at an aspect that is specific to animation: sakuga. I haven’t seen this term in scholarly literature yet, but there are various fan/journalistic resources online (see e.g. this collection of links) that explain sakuga. These definitions are fuzzy and somewhat contradictory – for instance, some stress the importance of the authorship of individual outstanding key animators while others are based on the number of animated frames per second – but all agree that ‘sakuga’ basically means ‘scenes of extraordinary animation quality’ (as opposed to the overall animation quality of an anime series). ‘Animation quality’ is, of course, another fuzzy term (is it about the amount of labour, ingenuity, or aesthetic effect? 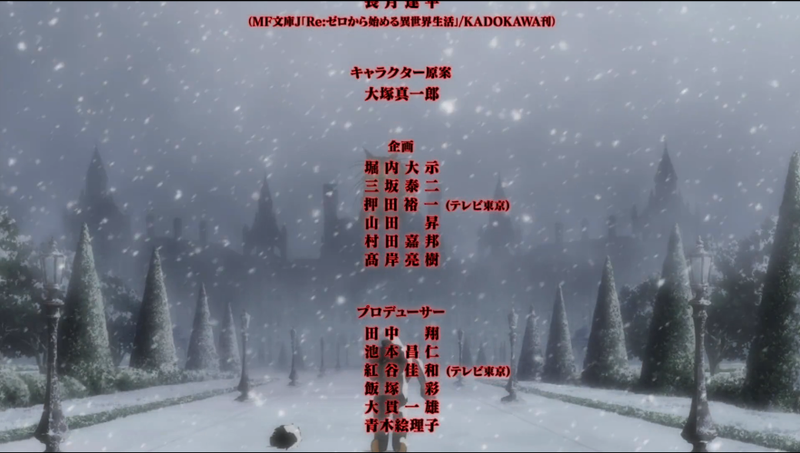 ), but let’s for once not overtheorise things and instead turn to some examples of what I feel might pass as sakuga. 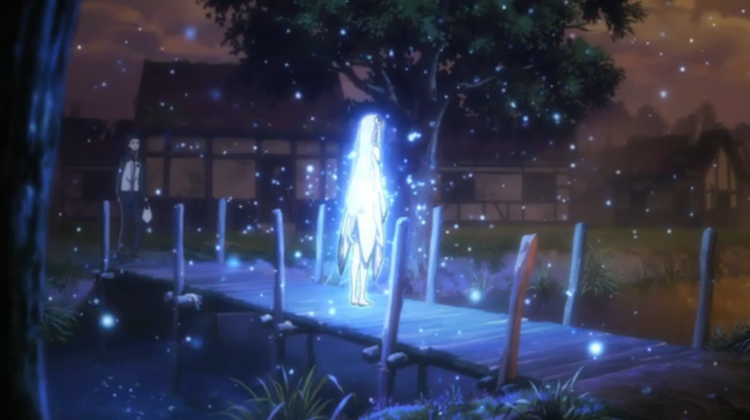 Episode 1A, 24:46-25:14 – Emilia summons the ‘lesser spirits’ which are essentially semitransparent blue spheres hovering in different directions, but they also illuminate both background and characters in blue light. Also notice how some of the spheres move in front of the characters and others behind them, so it’s not just one layer placed on top of the image. 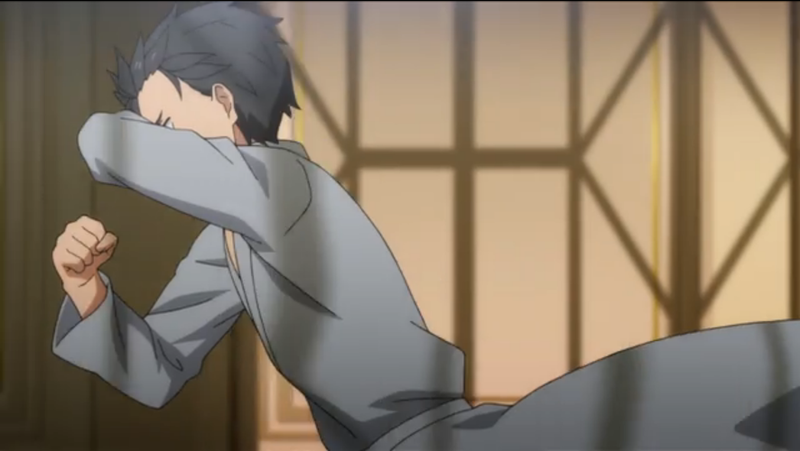 Episode 1B, 18:25-18:47 – Rom swings his club against Elsa, accidentally destroying his own furniture along the way. 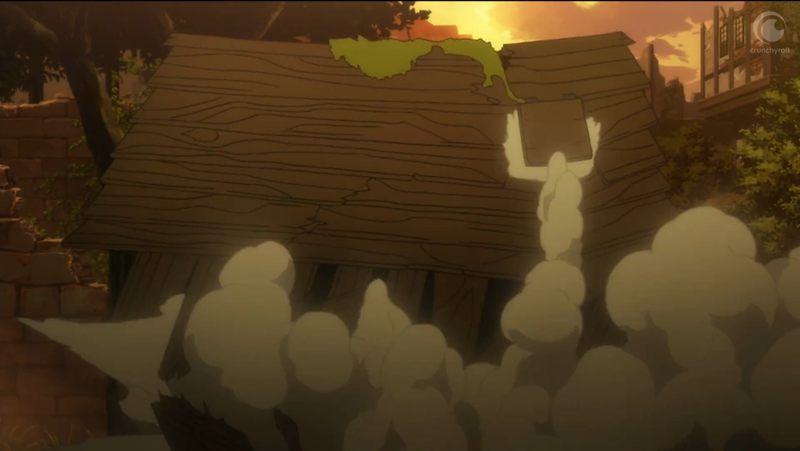 Collapsing structures are a popular motif of sakuga (see the ‘debris’ tag at Sakugabooru). 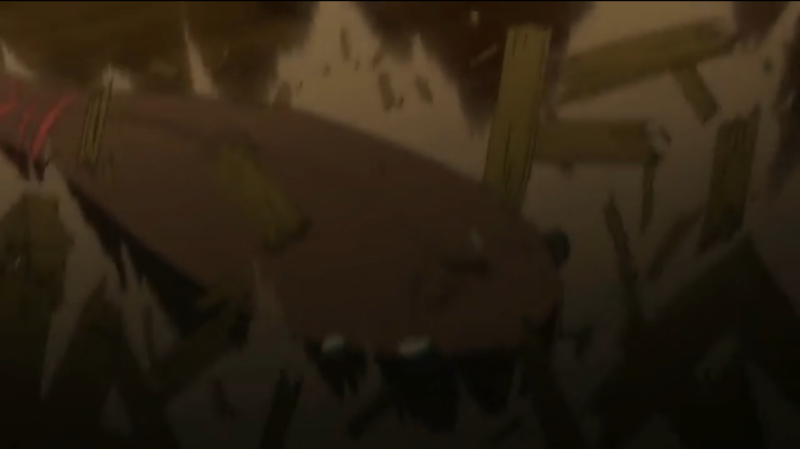 Episode 2, 16:01-16:05 – The hut into which Subaru crashes is another beautifully collapsing item. 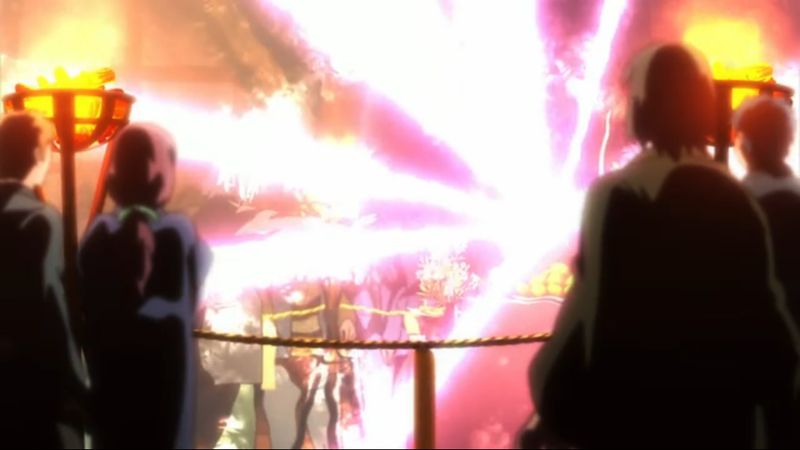 Episode 3, 16:28-17:03 – Reinhard’s impressive sword attack move starts with an effect similar to the ‘lesser spirits’ in Episode 1A followed by a quick succession of various other effects. Episode 4, 23:04-23:12 – Beatrice’s hair contracts and expands like a coil spring. Episode 5, 1:03-1:08 – Smooth animation of the shadows cast by the lattice windows. 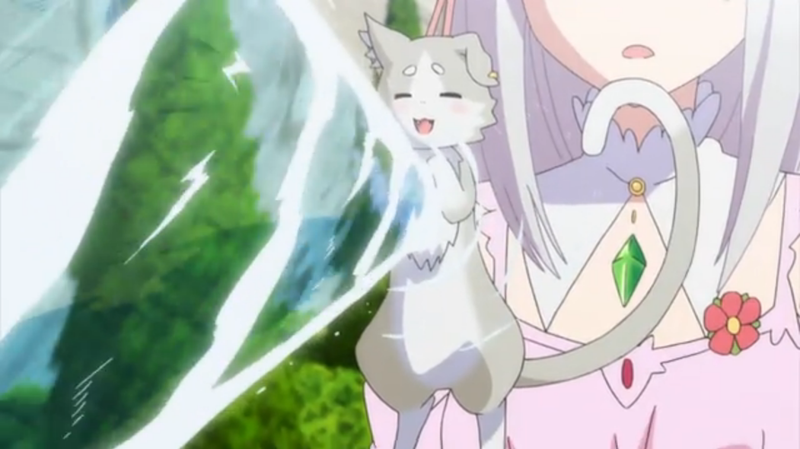 Episode 6, 5:22-5:31 – Puck conjures a jet of water which acts as a semi-transparent layer that twists the background and characters behind it. Episode 7, 18:54-19:36 – Another nice animation of Betty’s hair; this time her locks are being moved by the wind. Episode 8, 19:43-20:38 – Not so much a matter of animation per se, but the subtle colouring of this scene beautifully evokes the lighting situation at sunset. Episode 9, 10:09-11:16 – The fire of the torch and the braziers is both a moving semi-transparent layer and a source of lighting. 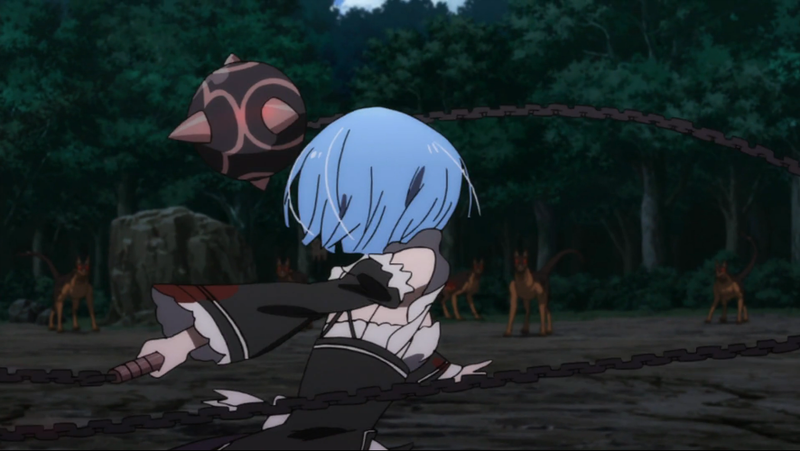 Episode 10, 19:37-19:43 – Rem’s chain moves like a chain should. 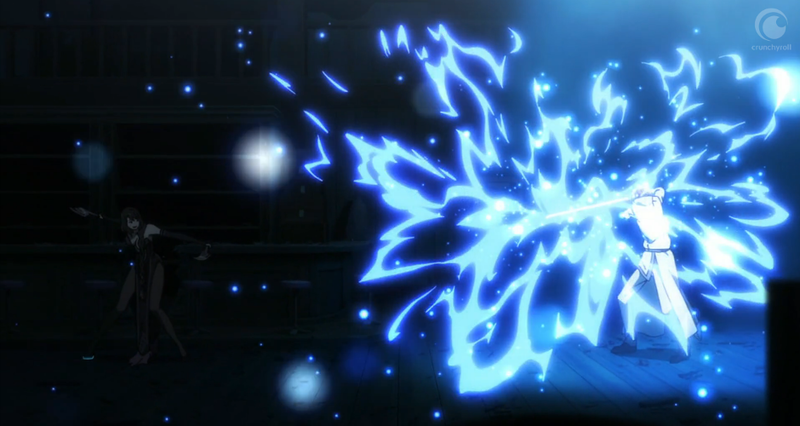 Episode 11, 0:46-0:50 – There are lots of magical special effects in this episode, the most impressive one right at the beginning while the credits still roll: rays of magical light followed by a kind of supernatural whirlwind. Episode 12, 0:36-0:45 – This one might be hard to see on the still because it’s such a subtle effect: sunlight falls through the trees and creates a pattern of patches of light and shadow on the characters which moves as they walk. 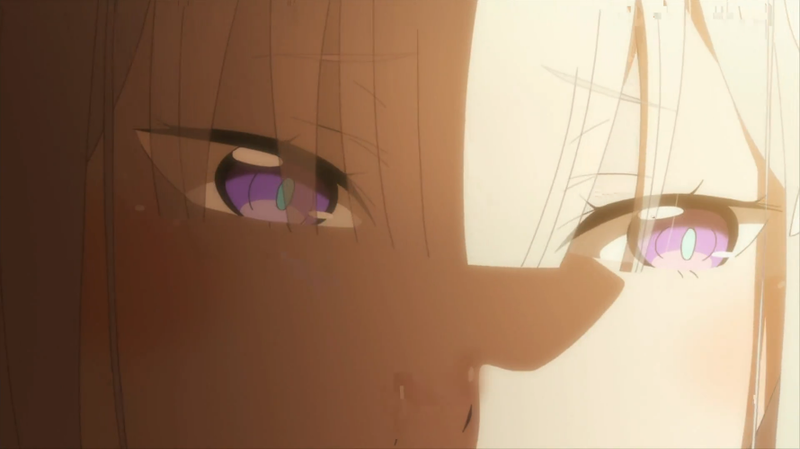 Episode 13, 20:47-20:48 – In close-ups such as this one, Emilia’s forelock (and also Rem’s) turns into an opaque layer. 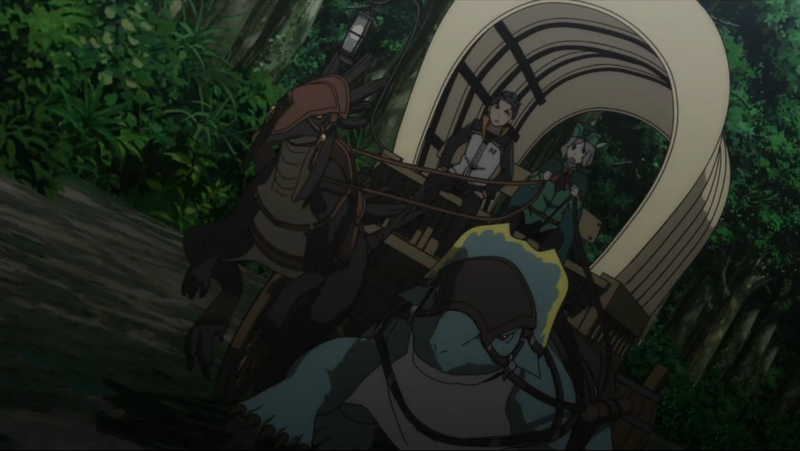 Episode 14, 22:11-22:13 – As the dragon cart brakes sharply, the ‘camera’ revolves slightly around it. 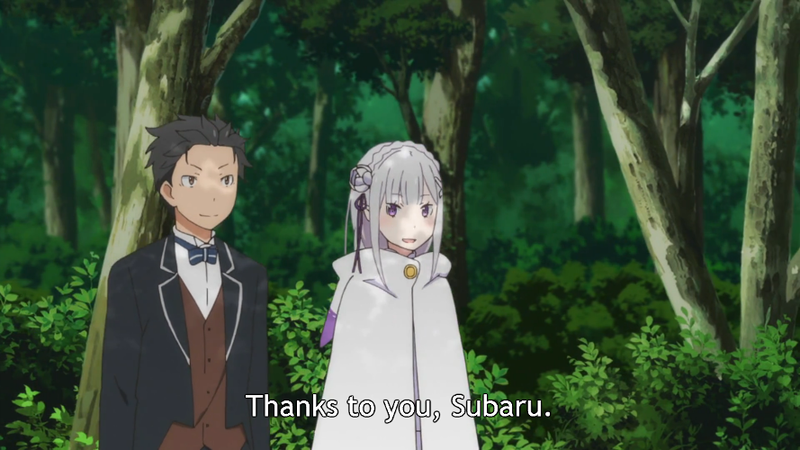 Episode 15, 21:28-23:16 – Many cool things happen in this episode, but it’s particularly famous for its long ending credits scene in which Subaru and Rem are slowly engulfed in an ever-intensifying snowstorm. 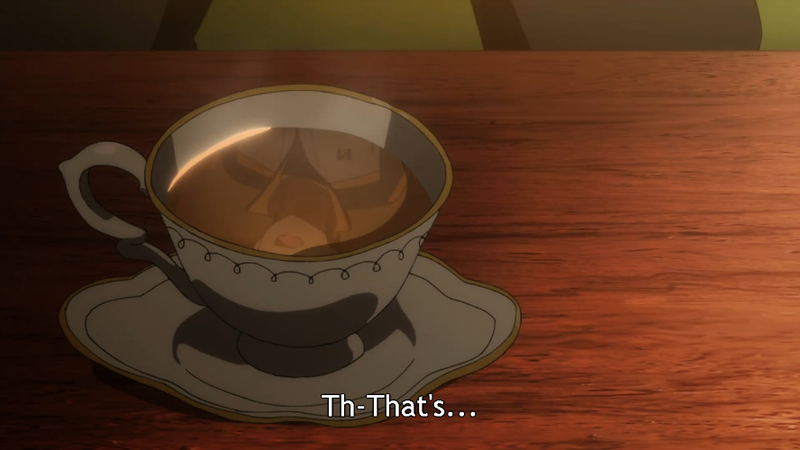 Episode 16, 3:57-3:59 – Subaru’s moving image is reflected in the steaming tea cup. Episode 17, 3:05-3:12 – The rope Subaru holds on to splinters. 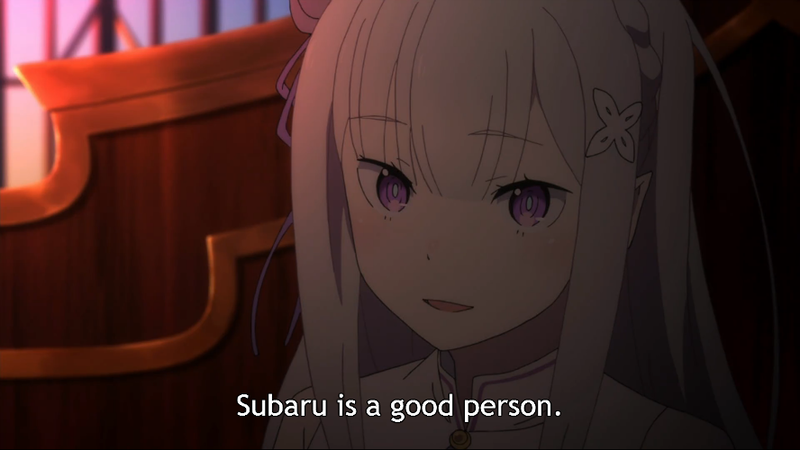 Episode 18, 4:12-4:15 – This episode has become legendary in itself due to the long and emotional dialogue between Subaru and Rem. 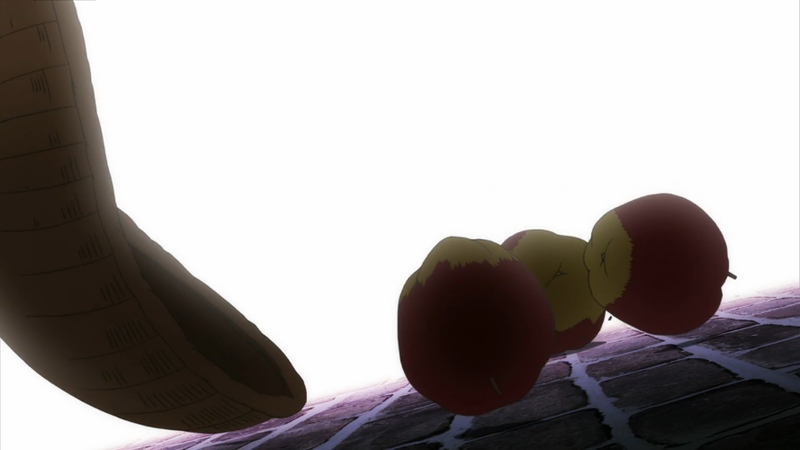 Before that dialogue, however, there is a brief shot of a bowl of apples falling to the ground, in which the objects move not only downward but also ricochet off the floor in different directions, and they even rotate too. 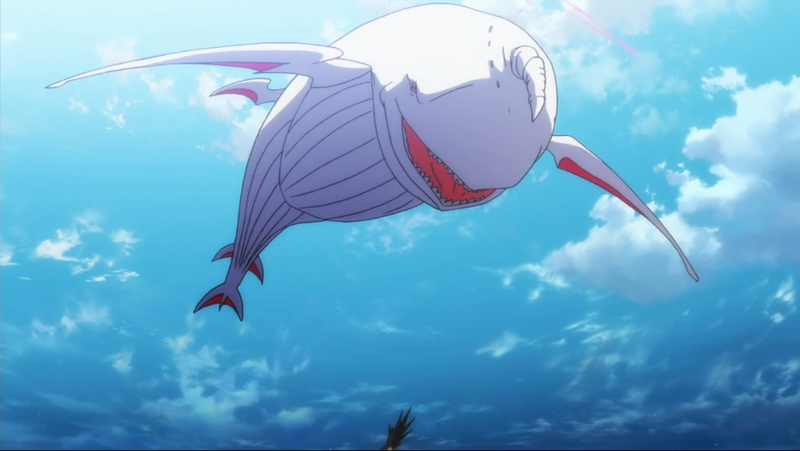 Episode 19, 23:36-23:55 – The White Whale’s halo tilts along with it. 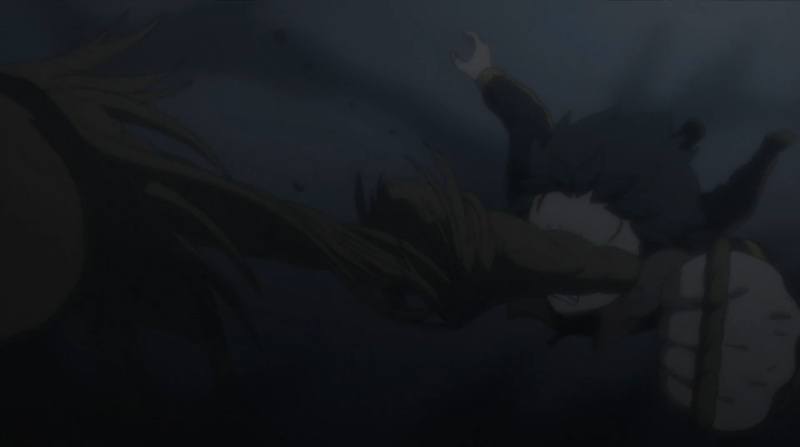 Episode 20, 5:16-5:19 – Another nicely animated shot of the White Whale turning in flight. 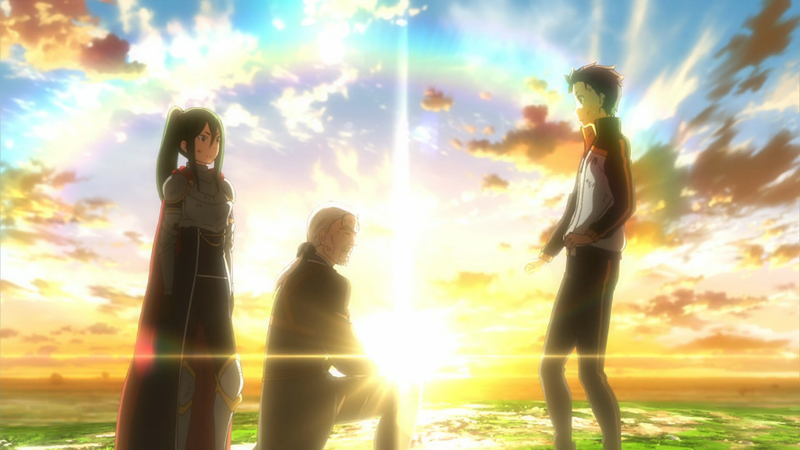 Episode 21, 19:42-19:52 – A backlighting effect employed three times in this episode: the rays of the sun seamlessly connect background to foreground. Episode 22, 3:50-3:55 – The spatial arrangement of the characters requires them to be moved in three layers as the ‘camera’ revolves around their circle. Episode 23, 13:28-13:33 – Explosions are a sakuga staple, and this one is a short but impressive combination of fire and smoke. 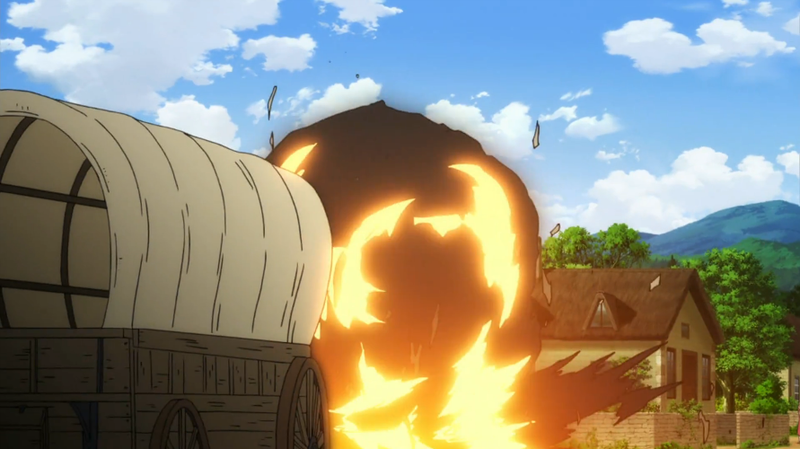 Episode 24, 8:03-8:07 – While the wagon moves diagonally to the left and away from the viewer, the lantern that is attached to it swings sideways. 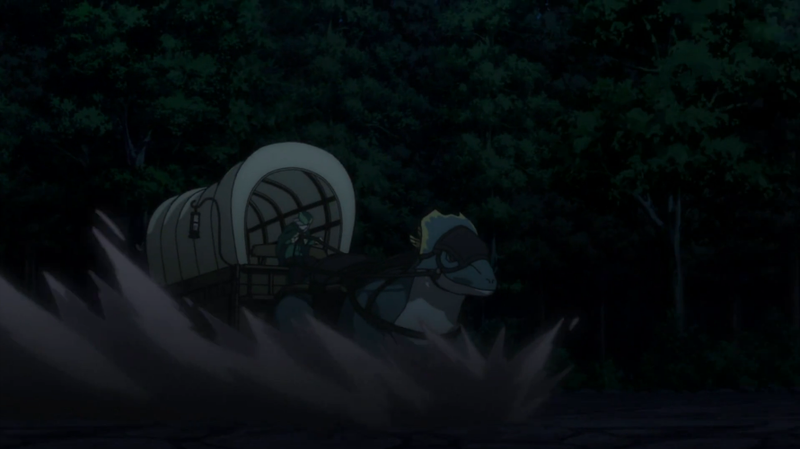 Episode 25, 8:02-8:13 – Otto’s wagon is drawn by both a two-legged and a four-legged creature. So these are the sakuga scenes I found most impressive in each episode. Did I miss one? Tell me in the comments. 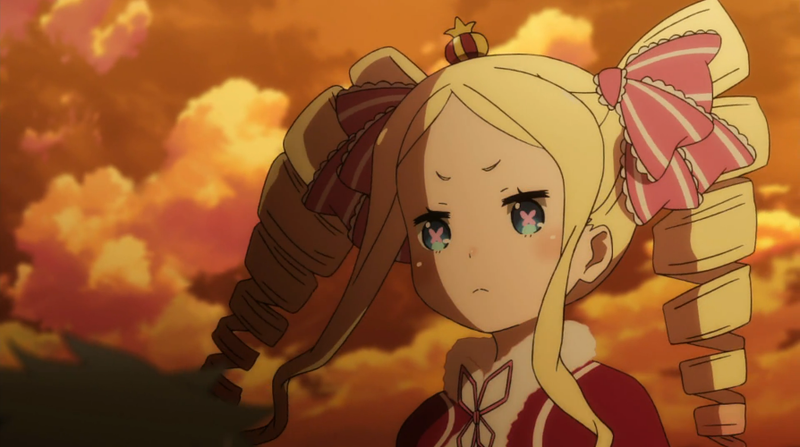 Check out the Re:Zero sakuga at Sakugabooru too.